Berlin Apartments Everything was good and organized - towels pots and pans - blankets. So surely I recommend this apartment. apartment Berlin Charlottenburg - Olbersstr. Berlin Apartments We had a lovely time at this apartment with our three boys. Beautiful historic building. Well equipped kitchen. Close to all the good stuff of Friedrichshain. And as always - we explored the city by bike - which is getting easier and easier over the years. Recommended. 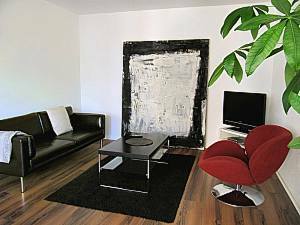 Berlin Ferienwohnungen The owner was very kind - the apartment ideal for a family of 4 and located in a nice location. Berlin Ferienwohnungen Great place - very helpful and friendly person meeting us. One slight drawback- a bit far from the S U bahn but there was a bus nearby. apartment Berlin Schöneberg - Potsdamer Str. 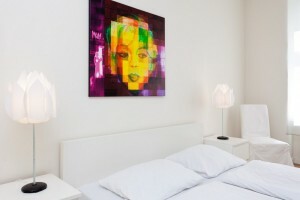 apartment Berlin Prenzlauer Berg - Käthe-Niederkirchner-Str. Berlin Apartments A lovely place to stay. The flat was very quiet - cool when the city was 30C and comfortable and clean. The service was friendly and efficient. The kitchen had everything one needs. Berlin Ferienwohnungen Excellent service - great big apartment. Couldn t have hoped for any better. Fantastic location - clean and just perfect for a family or two. apartment Berlin Mitte - Voßstr. Berlin Ferienwohnungen The owner was extremely helpful and friendly. The flat is in a superb location in the city centre. apartment Berlin Prenzlauer Berg - Esmarchstr. Berlin Ferienwohnung Excellent place and service. We will be glad to come back next year. Berlin Ferienwohnungen We enjoyed our stay in the house on the Prenzlauer berg. It was a great house - clean - neat and enough space for 9 people. And everything was there to have a nice stay! apartment Berlin Mitte - Alte Schönhauser Str. Berlin Ferienwohnungen The apartment was amazing - service also. But 2 things. - There was no wifi. - I received a lot of different phone numbers and email addresses so it really confused me where to contact anybody. apartment Berlin Charlottenburg - Kurfürstenstr. Berlin Ferienwohnungen We were a group of 5 people all coming from different places - arriving at different times to Berlin. We would like to thank you for your patience for coordinating everything on a Saturday. We ll repeat the experience with Mowitania for sure. apartment Berlin Mitte - Rochstr. The property is located on ground floor. In the accommodation should not be smoked. Public parking is available near the house. This accommodation has a highspeed / DSL - Internet connection. This accommodation is equipped with a washing machine. The accommodation is suitable for the disabled. Through the family-friendly establishment is this accomodation ideal for families. The apartment is quietly situated on the ground and is continuously available. Beautiful and charming 1-room appartment in the historical centre of Berlin - with french bed and nice, quiet balcony with wooden chairs and flowers. With wooden floor, cable-TV, DVD-player, a good and modernly equipped kitchen and a small, but luxurious bathroom. Elevator, parking available if needed. Here you will find a quiet place, although you are in the middle of a café-, restaurant-, and shopping area. Comfortable apartment in a very convenient location. 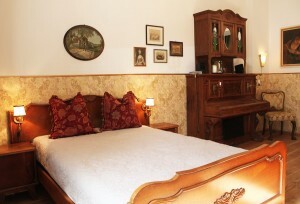 The apartment is newly furnished and suitable for 6 persons. 2 double beds (160x200 cm) (180x200 cm), sofa bed (140x200 cm) and 2 single beds (90x200 cm). There is a TV in two bedrooms. The kitchen has a dining table, electric stove, refrigerator etc. The bathroom is equipped with a bathtub. The apartment is very suitable for families with its family-friendly features. Cribs, children's books and some toys are available. Apartment with separate kitchen and bathtub, calm, very light and a view over Berlin from the balcony of the 5th floor (with elevator). Sleeping room with double bed, living room with sofabed, LCD-TV, DVD, free wifi internet and radio. Fully equipped kitchen with coffee machine, toaster, kettle and oven. Bathroom with tub and shower, coin-operated laundry in the building. Central located: Brandenburg Gate, Potsdamer Platz, Jewish Museum, Checkpoint Charlie and Galery Lafayette are in walking distance. Metro station U Kochstrasse is in front of the house. By metro you will reach popular Oranienstrasse in a few minutes. The complete Apartment is offering WLAN DSL. The parking is for free, just ask for a parking permission at your arrival. The place „Hackische Markt“ is one of the most centralized cultural locations in Berlin with several high quality bars, clubs, restaurants and shops. From the apartment you will perfectly reach every sight seeing location (Brandenburg Gate, Checkpoint Charly, etc.) by foot or within some minutes by metro or bus. The scene districts Kreuzberg, Prenzlauer Berg and Friedrichshain ar all three reachabke within 5-10 minutes by Metro. 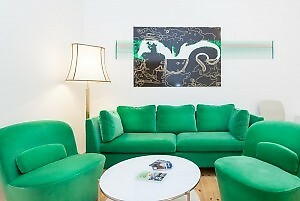 The Apartment is perfectly located for a short trip with friends and family to Berlin. The apartment is centrally located and with good transport connections. Busses and nightbusses take you to Kurfürstendamm and Tauentzienstraße (shopping mile) or to Berlin's happening districts Kreuzberg and Friedrichshain. Suburban and subway stations with direct connections to Potsdamer Platz, the Mitte district with the 'Museum Island' and Hackeschen Markt, can be reached on foot.